On December 16, 1773, members of the Sons of Liberty, disguised as Mohawk Indians, boarded three British ships docked in Boston Harbor and dumped overboard their entire cargo of black tea. This event, of course, became known as the Boston Tea Party. But did you know just prior to the raid, these war-painted colonialists were mustering their liquid courage at the Green Dragon Tavern down the road? And afterward, the men returned to the Green Dragon, composed a song to stick it to King George, and, I’m just guessing here, got wrecked. Before the battles of Lexington and Concord in 1775, minutemen were gathered at places like Wright Tavern and Buckman Tavern. Indeed, some say that "shot heard ’round the world" came from the Buckman. (I can hear General Gage now, screaming, Those Massholes!) Two years later, while pursuing General "Mad Anthony" Wayne in Pennsylvania, British redcoats captured a colonist suspected of knowing Wayne’s whereabouts. He was interrogated and tortured at the General Warren Inne. With information successfully extracted, the British then killed 53 Americans near another tavern (Wayne escaped). On a happier note, when George Washington resigned his post as general of the Army years later, he was given a massive sendoff at the City Tavern in Philadelphia. Washington and 54 of his friends went through 60 bottles of Bordeaux, 54 bottles of Madeira, 34 bottles of beer, 8 bottles of cider, and even a few bowls of rum punch. These taverns are still around. So why not embark on a journey that combines a bit of history and a bit of booze? That was Adrian Covert’s wonderful idea when he wrote Taverns of the American Revolution. "I aspired to create a navigable catalogue of surviving Revolutionary taverns from which history nerds like me could plan their own tavern road trips," he explains in the preface. Count me in. But how to decide which establishments to include? "The tavern had to be located in one of the original thirteen colonies," the author clarifies, "it had to have been built prior to 1800, and it had to have been used as a tavern at the time." As for what distinguishes taverns from bars, the former "were often a town’s only public building," writes Covert, and served as, among other things, banks, hardware stores, barbershops, hospitals, courts of law, and brothels. (Remind me why there aren’t more of these around?) In all, he covers 171 taverns that still operate in some capacity as inns, restaurants, or museums, lists another 140 in the index, and profiles 21 taverns in depth. The oldest is the White Horse in Newport, R.I., which dates back to 1673. During the Revolutionary War, it was occupied by the Hessians. Gadsby’s Tavern in Alexandria, Va., was favored by George Washington, who celebrated multiple birthdays there. 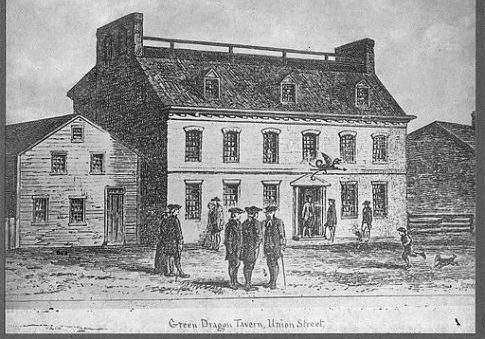 Fraunces Tavern turns out to be the oldest building in Manhattan, built in 1719 and converted into a tavern in 1762. (The author does not mention that Fraunces Tavern was the site of other revolutionary activity two centuries later: In 1975, Puerto Rican nationalists detonated a briefcase inside the tavern, killing four and injuring dozens.) And although Covert does not say which taverns are supposedly haunted, it’s probably best to avoid overnighting at the Colonial Inn in Concord, Mass.—particularly room 27, which once served as a morgue. Taverns makes for interesting but light reading, and the history occasionally repeats itself: The "Rally Mohawks" song is printed twice; an explanation of the Intolerable Acts, identical details of the Battles of Lexington and Concord, and the Paoli massacre are repeated twice; and the inventory of the drinks consumed at General Washington’s farewell party at the City Tavern is listed three times. I suspect an editor was concerned the book wasn’t big enough, so Covert was probably asked to "bump it out," mix in vignettes and "fun facts" (hence the repetition), add drink recipes and as many color photos and illustrations as possible. But, by and large, it works. Nearly all of the cocktail recipes sound enticing—don’t get me wrong, I’d like to drink flip for historical reasons, but boiled beer mixed with egg, molasses, and rum isn’t exactly my thing. And speaking of food, I’m dying to check out the Publick House Historic Inn in Sturbridge, Mass. It serves "traditional tavern fare," writes Covert, "including lobster pie, pot roast, and roasted turkey, each served in continental proportions." Lobster pie? Continental proportions? God bless America.